With the view of the Dhauladhars at the front and the Deer Park at the back, goStops Bir (Stops Hostel Bir) is amply located in Bir. Also, the paragliding landing site and all other marketplaces are at a walking distance from our hostel. 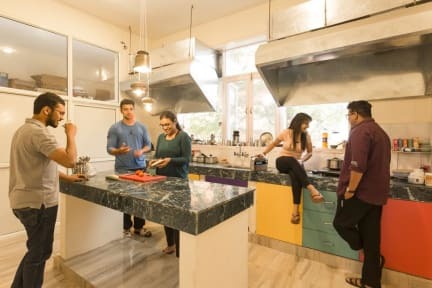 While you stay in our dorms or private dorms you can blend yourself with the travelers from across the globe and engage yourself with the various in-house activities. Free wifi features the whole property. Our friendly staff is always there to help you. We are also bigtime chai lovers! Endless conversations over chai is the thing we can do forever! The nearest airport is Gaggal Airport, 45.1 km from goStops Bir (Stops Hostel Bir). 1. Our check-in time is 13:00. and check-out time is 10:00. We follow a 100% advance policy at the time of check-in, which means that you will have to make 100% advance payment for the stay booked, at the time of check-in. We also collect a fully refundable linen deposit of INR 500 at the time of check-in. This deposit is returned to you at the time of check-out up on handing over the linen back at the reception. This is to ensure non-intrusive housekeeping in the dorms. 2. 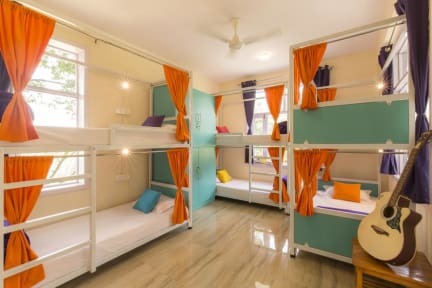 For guests arriving at the hostel before check-in time, early lounging facility is available from 06:00 to 13:00 for a fee of INR 150. This gives access to our many common areas to relax before check-in into the room. For guests arriving before 6 AM, we advise the guest to book the previous night, to ensure that you get a good rest. areas including the huge AV room with sprawling cushions and the Bar area with computers to work on are fully airconditioned. Also, a fan is provided in the rooms that can be used during these hours for ventilation, in case you wish to stay in the room during these social hours. to confirm the booking. Please note that normal cancellation policy, does not apply to group bookings of 5 or more guests. original passport along with a valid visa at the time of check-in. For Pakistani citizens, an additional residence permit letter from the High Commission of Islamabad is also mandatory for check in. Notice to customers: At the point of collection of credit card information, Hostelworld will never contact customers directly to request CVV numbers and that they should not provide CVV numbers to properties. Great hostel. Loved the rooftop and watching the paragliders. Very well run with staff helping with anything you want. The staff was very cooperative and friendly. Enjoyed a lot at the hostel and met many awesome people. Great place to stay if you're traveling alone or with friends. Property is amazing, nice location and good staff. Only thing is that you need to wrap up your party before 12:00 at night which is a lil strict for a hostel. It was unexpectedly amazing experience. It was great to stay at Gostops. The ambience was awesome, the staff was friendly and so the other hostellers. For anyone thinking about staying at GoStops Bir Billing, don’t. If you intend to arrive late, you will locked outside for 10 minutes, only to be greeted by an incompetent security guard who will grunt at you, yell, cough in your face and angrily bash the phone as a way of suggesting you call the manager. This process was rather shocking considering we had been told the hostel reception is open 24hrs, and we were welcome to check in whenever we wanted. Thanks GoStops for the friendly welcome.